Less than a month after the 2010 World Cup wrapped up, a major mining accident in Chile made headlines around the world, as 33 miners were trapped by a cave-in. They survived an incredible 69 days under ground before being rescued in an operation that was televised worldwide. Chile made the round of 16 in 2010, finishing second in a relatively easy Group H (with Switzerland and Honduras, along with Spain) before losing 3-0 to Brazil in the first knockout stage. For this month's World Cup, though, the road will be harder. The Chileans are in the so-called "Group of Death" with Spain, the Netherlands and Australia. 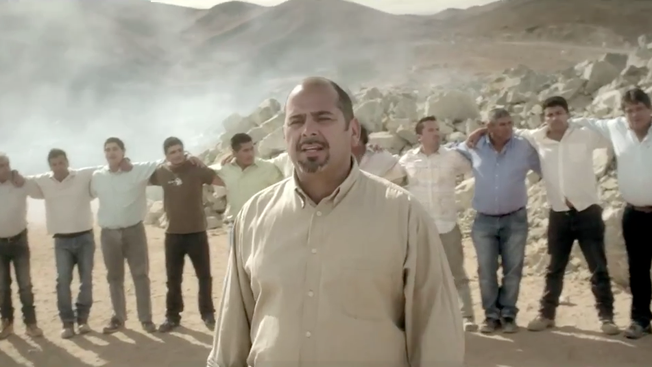 Luckily, they have some pretty hardened fans backing them up—the miners themselves, who give their national team a spectacular pep talk about beating the odds in this wonderful, rousing commercial for Banco de Chile. Not surprisingly, it's Mario Sepulveda who leads the speech. Sepulveda earned a reputation as camera friendly within minutes of being rescued, and here he works himself up into a lather. "Spain is tough? Netherlands is tough?" he shouts. "We don't fear the Group of Death. We don't care about death. We defeated death before!" Sure, you've got the highly paid athletes in the blockbuster spots. But sometimes it's the real stories—like this one, and Nico Calabria's for Powerade—that make for the most evocative World Cup ads. Click the CC button on the YouTube video for English subtitles.